The Sunshine State is one bright spot in otherwise gloomy national achievement results and should be an exemplar to other states, Education Secretary Betsy DeVos said Thursday. 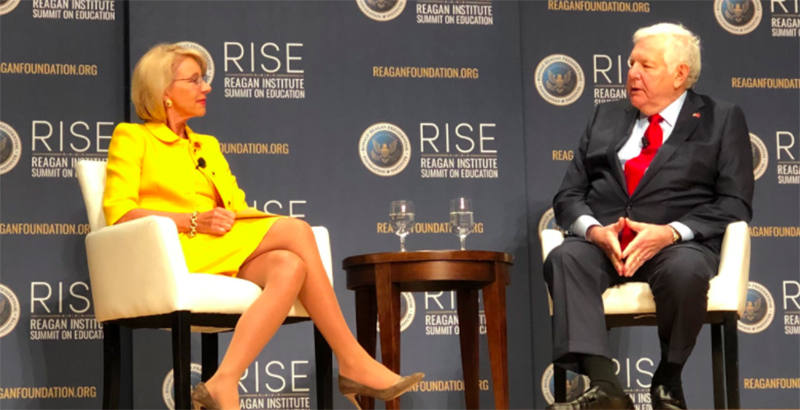 “Overall, we are still a nation at risk, and I would say even greater risk today,” DeVos said at the Reagan Institute Summit on Education, celebrating the 35th anniversary of the landmark “A Nation at Risk” report. The document famously warned of a “rising tide of mediocrity” in American education. DeVos spoke in a “fireside chat” with William Bennett, President Ronald Reagan’s second education secretary. The National Assessment of Educational Progress also serves as benchmark and is known as the “Nation’s Report Card.” The 2017 results were released this week, showing fourth- and eighth-grade achievement in math and reading were largely flat, with some exceptions — including, most notably to DeVos, Florida. In the late 1990s, Florida students ranked 47th to 49th among the states on the exams, but this year fourth-graders are achieving in the top 10, DeVos said. 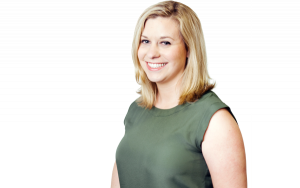 “It’s really attributable, I think, to this concerted effort to tackle reforms on a student-focused, student-centered basis,” she said. Former governor Jeb Bush in the late 1990s started a host of reforms, including A–F school grades, more flexibility at the local level, requiring third-graders to be able to read before they are promoted, rigorous and generous performance-based pay for teachers, and new school choice programs, the secretary said. DeVos also cited Florida scores showing improvement among the lowest-performing students, even as scores among the lowest-performing students dropped on three of the four exams nationally. Florida was one of five states to see statistically significant improvement in three of the four age/subject groupings over the past decade. Two other states and the District of Columbia made progress in all four. DeVos in a statement after NAEP results were released earlier this week also highlighted Florida’s successes. Bennett commented that when advances are made in medicine, other doctors are quick to follow suit, but that is not always the case with education leaders. DeVos said other governors and state legislators should realize that simply implementing one reform won’t be enough to get the kind of change Florida has seen. DeVos and Bennett also talked briefly about higher education and a pending reauthorization of the Higher Education Act in progress in Congress. “I think it would behoove them to take a couple steps back and say, ‘What is the role of the federal government in supporting education beyond high school?’ and ‘We need to take down the silos that have artificially grown up’ ” between traditional four-year universities and career and technical education, she said. Sen. Lamar Alexander is the Republican chairman and Sen. Patty Murray the ranking Democrat on the Senate committee that will rewrite the bill. The two were also on hand at the Reagan Institute summit, saying earlier in the day that the constraints of the Senate calendar, upcoming midterm elections, and wide gaps on policy mean it’s unlikely a reauthorization gets done this year. As “A Nation at Risk” turns 35 in April, The 74 is publishing an array of articles, columns, retrospectives, and previews tied to the Reagan Institute’s “Summit on Education” in Washington, D.C. Read our full series here. Disclosure: The Walton Family Foundation provides financial support to the Reagan Institute Summit on Education and The 74.